Bloody pavement greeted me as I left Peckham Rye station on Saturday afternoon. Moments before I arrived, some guy had his hand chopped off by unknown assailants. Now, with the street festooned with POLICE LINE DO NOT CROSS tape, forensic detectives swabbed blood off the concrete. Twenty minutes later everything was back to normal; smiling shoppers wandering down the street, over the rapidly coagulating bloodstains. It was a dislocating experience: I'd come for art, not mutilation. Tucked away in the shadow of the attractively crumbling Bussey Building, between warehouses that ship goods to sub-Saharan Africa and optimistically affluent pop-up cocktail bars, Bosse & Baum isn't the easiest place to find. I'm helped when, as I'm wandering around, I'm accosted by a silent Romanian-looking woman wearing a leering mask of Nigel Farage. Discombobulated, I was led into a warehouse and into a small tent. Shoved inside, the door was zipped up tight. 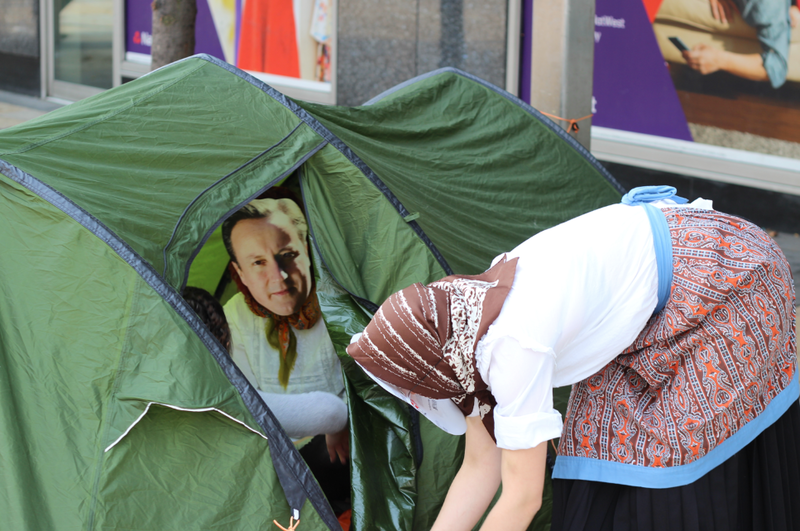 Within sat a similarly dressed woman, this time wearing a David Cameron mask. She popped some headphones on me, from which burbled a robotic drawl. She then performed a silent palm reading before instructing me to clap my hands like a seal, then ushered me from the tent. My initial reaction? "What the hell was that?!" Later research revealed this to be There There, performing a piece called Text Home to 78070 (the name taken from the famously crap Home Office campaign of the same name). Jamming together a stereotypical Romanian outfit with the faces of the politicians who'd use their presence for political gain, this work aims to jolt its audience into a new mindset. There's something quietly terrifying about being snatched off the street, shoved somewhere confusing and being given an obtuse lecture, the experience giving the tiniest of tiny tastes of the worst fears of illegal immigrants. Best of all is the conflation of monstrous, Daily Mail cartoon-ish visual stereotypes of Romanian-as-monster and the actual monsters of Cameron and Farage. Their smugly satisfied faces peering out from patterned headscarves chill the viewer to the bone; eyes like sharks and jaws locked in mock humour. This is my kind of performance; aggressive, ragged and intensely political. After a quick pop out for some dinner, during which I unfortunately missed Ana Mendes' Self Portrait, I returned just in time for Charlotte Law's Ode Action. I'm friends with Charlotte and have attended a number of her performances over the last few years. Judging from what I've seen she's locked in a neverending loop - rigorously reconfiguring and reworking ever more worn materials. From within a crinkled space blanket emerge what I'm pretty sure are the remnants of a burnt piano. This together with other junkyard ephemera, is placed on bungee cords suspended from the ceiling. Soon a row of gently bobbing Blair-Witch-a-like mobiles is improvised, weird new structures created from trash. Law continues this across the space; new shapes popping up, things being speared on one another or carefully balanced, before collapsing with a wooden clunk. 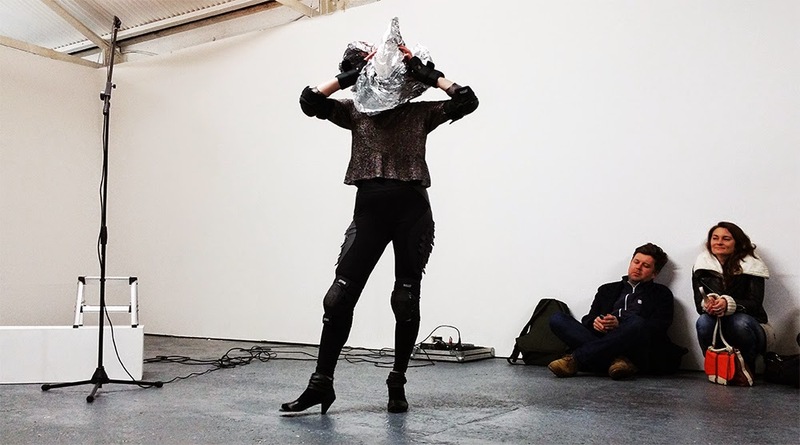 She's accompanied by another performer, who contributes apparently random barks of noise, before bending over to twiddle with a variety of gadgets, all of which emit ominous sounding voices. By way of reply, Law occasionally vocalises a stream of guttural sounds in a language I either don't recognise, or that's made up. There's a quiet aggressiveness to this that borders in nihilism, as if Law is playing in the ashes of a burnt world. Here form, language and architecture have deteriorated to their base elements, being cut up into jagged and unfamiliar new shapes. Following that was Justyna Scheuring's Didn't you know that. Scheuring bores holes in the audience with a baleful glare, apparently regarding us with a mixture of contempt and disappointment. Wearing a superhero-styled black body suit and silver top she stands atop a small step and says either "Yes. Yes." or "No. No.". As she does this an assistant activates a smoke machine, sending polite plumes of dry ice into the audience. Two things can happen after this. If Scheuring says 'Yes', she will find a place to pose in the gallery space, often imitating the body language of action of someone in the audience. If she says 'No', she will find a spot and let out a bloodcurdling scream. She's got a deadpan poker face throughout, the ridiculousness of what we're watching eventually sending rippled giggles around the hushed crowd. Easy highlights are the held moments when she picks on someone and maliciously eyes them, conducting a clinical dissection with her gaze alone. Next is when she's stalking the room looking for a space to scream. At one point we hear a timid knock on the gallery door. Like a shark scenting blood she makes a beeline for it, and presently we hear her yelling into the Peckham dusk. After this she dons protective pads, thumping herself around on the floor and walls before tottering about in heels with a piece of tinfoil in her mouth. I have no idea what the hell this means - but I'm guessing this is a catharsis that can only be achieved with the hungry eyes of an audience upon the artist. I hopegenerally doomy presence was an act. If so, it's an impressive one. If it's not I hope that the performance - whatever it meant - helped in some way. Either way it was a pleasantly baffling experience. A pretty neat evening of performance art in a pretty neat place. And, vicious street amputations aside, a wonderful time was had in Peckham. If you are searching for the #1 Bitcoin exchange company, then you should know YoBit.